I bumped into an article about Muay Thai online. Chanced upon it. I love martial arts but only ever done Tae-Kwan-do as a kid. Decided what the heck, quit my job and travelled to Phuket (Soi Tai-Ied) to give it a crack. YOLO moment. As a matter of self-discovery, Muay Thai did not affect my knee condition one bit. Also, I opted for skipping rope instead of running for warm up. It worked a treat. The 1st 2 weeks of Muay Thai were hell .. pleasure in pain type of hell where I felt sore and pain in areas of the body I never knew I could feel sore in. I enjoyed the intensity and after having been a year out of fitness I usually got nervous before pad work wondering if I'd have the stamina required. Read The Original Article where this comment was posted: Muay Thai vs. CrossFit for fitness. 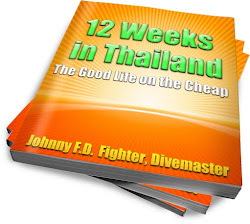 If you haven't already, read the book 12 Weeks in Thailand and get money saving tips on doing your first Muay Thai fitness camp in Thailand!